Reports the sum of total amounts and taxes break down by different taxes. You can use it for monthly report of VAT, annual report, report for a customer or other purpose. Many parameters for creation of different reports! 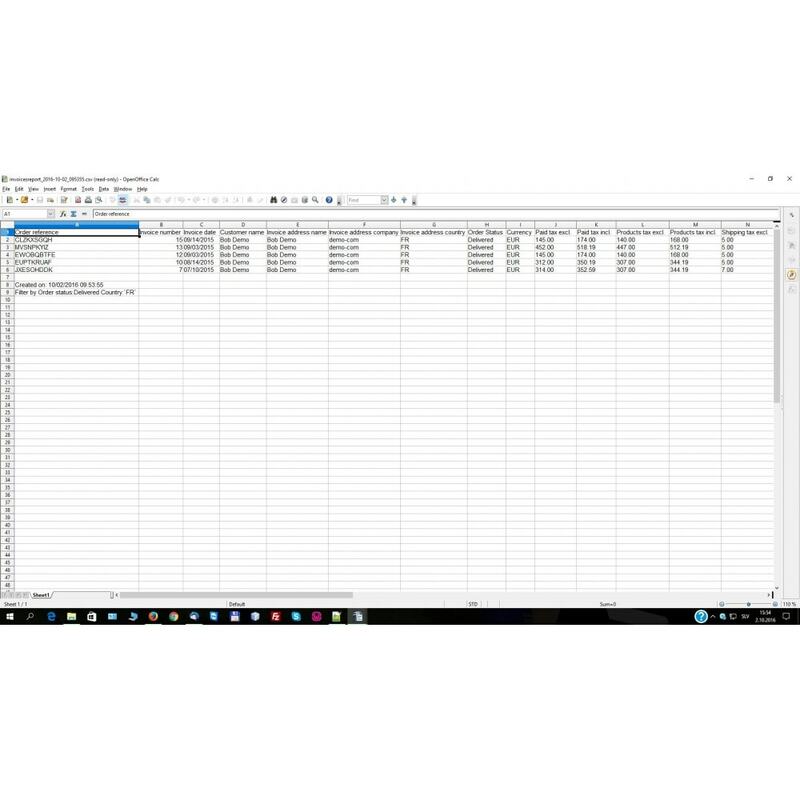 Exportable to PDF and CSV. Listed invoices can be filtered by search keys. Keys can be used simultaneously. For example, you might need to search for invoices of the certain customer, created within the specific date interval, having their payment method 'Bank wire payment'. Invoice number (lists all invoices having number matching given text pattern). For example, if your invoice number format includes year, e.g. all invoices for the year 2015 having their number like 15-xxxx, the you can use text pattern '15' for the invoice number to list all invoices of the year 2015. Order status pre-filter selection enables you to display invoices with the same order statuses. For example, if you want to generate the report for all invoices that match predefined criteria: 'Waiting for Bank Wire payment', 'Waiting for PayPal payment', 'Waiting for Cash on delivery', you have to check these three statuses in the form 'Order State' and click 'Save'. Now, only invoices that match checked statuses are listed. The report calculation is performed for the listed invoices only. Besides, order status form also shows the number of orders for every status. That is the absolute number of orders, regardless of the search filter. Bellow the list of invoices, report with summed amounts is displayed automatically. Summed values are calculated for Invoices being currently displayed (plus Invoices being hidden behind the limitation of a window display number, but meeting same filter criteria). 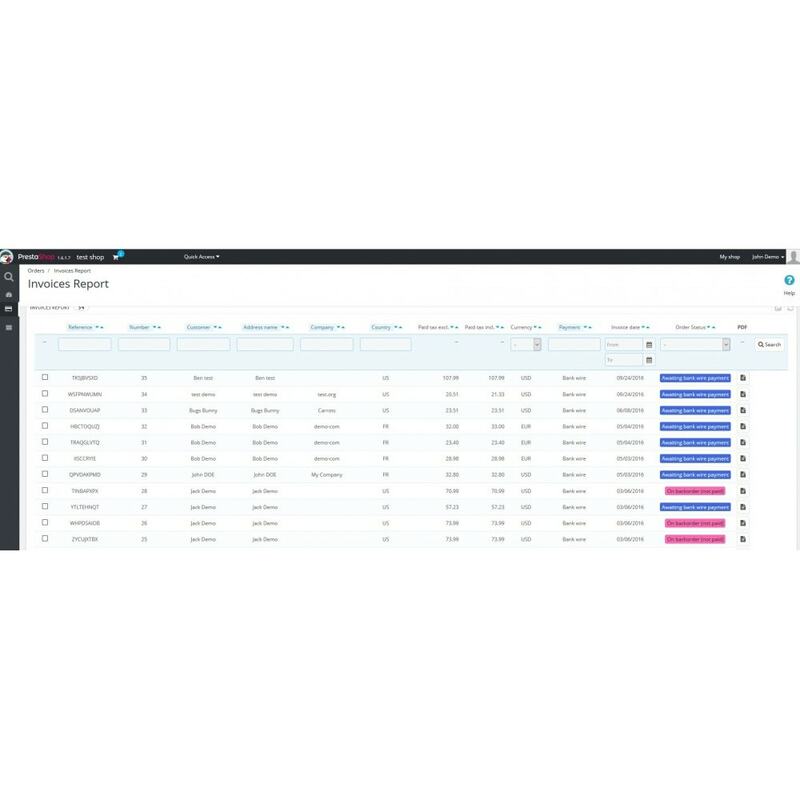 You can filter Invoices and create specific reports, e.g reports for a specific customer, date interval, order state and similar. - Taxes are summed separately for each tax type found for the listed invoices. - Total values for products tax excl./tax incl. [ If enabled] are displayed separately for products by different tax types. NOTE: If discount coupons are used in your orders, this option works correctly only for discounts with percentage reductions. If discounts with absolute reduction amounts are used, module does not calculate such discounts in the total amounts for products by different tax types. - [If enabled] Total amounts for other taxes are displayed, like shipping, wrapping or other tax types found in your database. 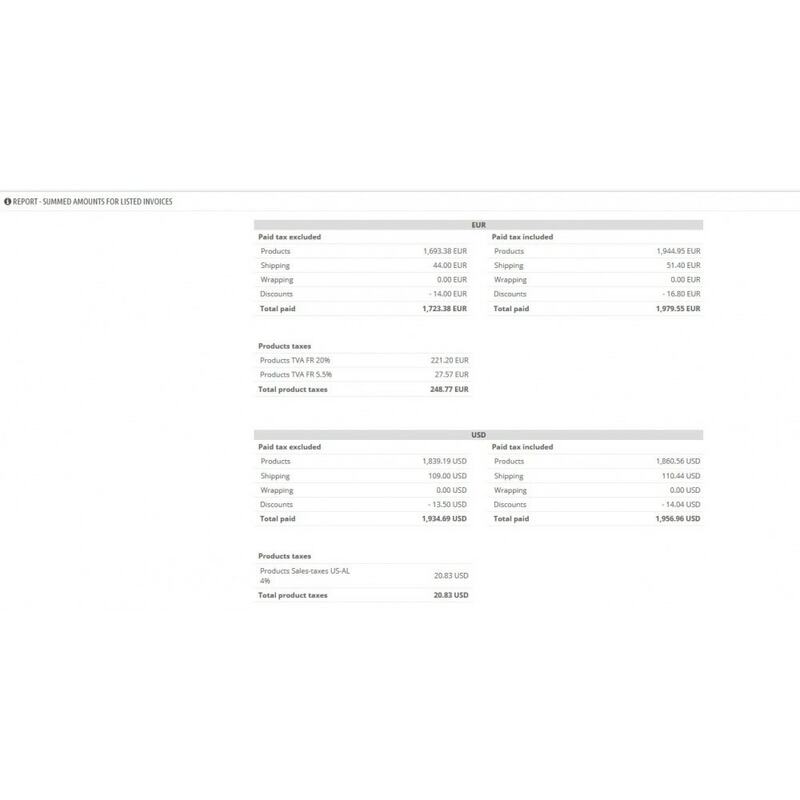 - If there are invoices with different currencies in the list, separate REPORT is made for each currency. Individual invoices can be downloaded to PDF. List of invoices with report can be exported to PDF file. Details on search filter are written to PDF, so it is clear what search filter was used to generate the report when PDF is printed or sent to your 3rd parties. By using bulk actions menu at the bottom of the list of invoices, selected Invoices can be downloaded to PDF with one click by clicking 'Generate Invoices PDF' button. List of Invoices with tax details for individual invoices can be exported to CSV file. Data can be imported from CSV file to Excel or Googledocs sheet or any other CSV supporting application, to further process your data. Displayed amounts for products by different tax types. Use semicolon as column delimiter for CSV export. 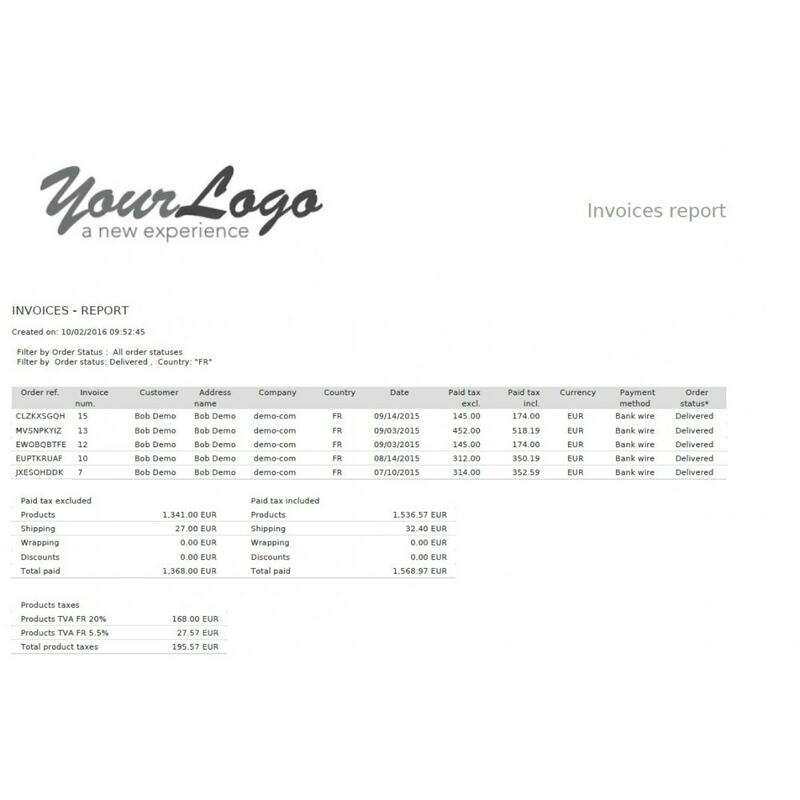 You customers can get detailed report on invoices for their purchases. Note: This module does not provide any front office functionallity directly accessible to your customers. But you can for example inform your customer that report on their invoices can be sent to them on request by sending them PDF or CSV file. Advanced export of orders to CSV, including product details. Have the sum of total amounts for listed orders exportable to PDF. Use of advanced search parameters. Create invoices for selected orders with one click.